Naomi Van Caillie has been a Library Assistant with DIT for the past 8 months. She is a 2016 MLIS graduate from UCD with previous work experience in the public library sector in Canada. This was a daylong seminar in which a variety of guest speakers presented on a multitude of topics relating to Teaching and Learning in relation to libraries, librarians and the demographics we as Librarians are trying to reach and assist. My main reason for attending was that I feel even in my position as Library Assistant there are daily opportunities for teaching and learning interactions with the students. I want to better equip myself with knowledge that will assist me in more successful and rewarding interactions with our library visitors. 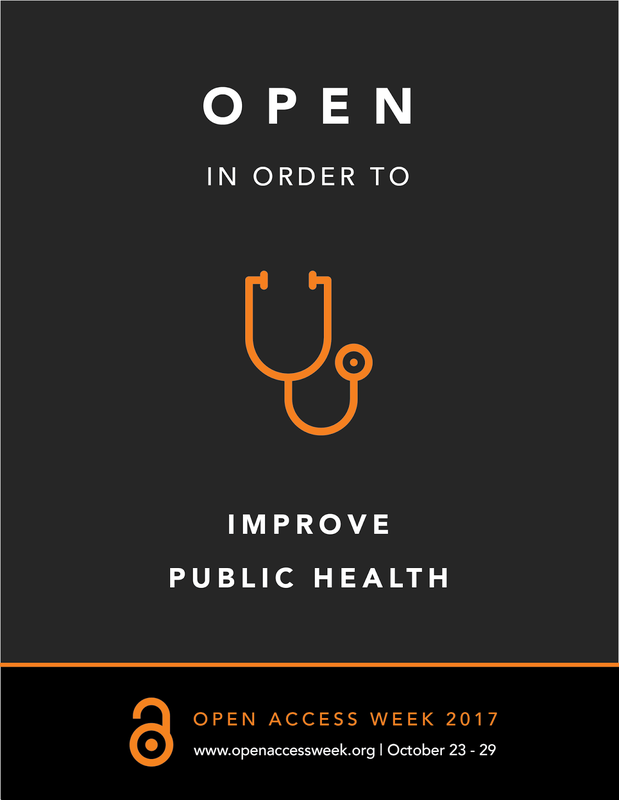 I want to be able to deliver information and resources to meet their unique and individual needs effectively. I want both the students and I to always have an opportunity to engage and learn from each other. There was so much wonderful information shared from all of the speakers. I have chosen to comment on the four that impacted me the most. You can find the PowerPoint presentations for all presenters here. David Streatfield, Global Libraries Initiative Consultant, started the morning off by sharing with us ‘How can you tell if it is working? Evaluating the impact of educational innovations’. From this I gathered that regardless of what innovation you are creating or using to interact with your demographic, it is crucial and beneficial to be able to evaluate the impact of your services, whether the results are positive or negative; intended or accidental. He argued that we need to be looking and analysing the change(s) as a result of what we are doing also known as impact evaluation. He describes this method as a simple logic model providing both illuminative evaluation and impact evaluation which makes up a contribution model. To put things simply the common factors are that the theory of change creates a framework for focus. We must remember that our innovations, no matter the scale, should be plausible, doable, and testable. From this I think I am approaching my work and daily interactions with our users from different vantage point so I am better able to reflect and analyse for continued growth and improvement. Another stand out for me was Barry Houlihan, Archivist at NUI and CONUL Teaching & Learning Award Winner of 2016. The more Barry spoke the more intrigued I was by NUI’s, his and Dr Paul Flynn’s, innovation and success. What I took from it was that at the core of their project was the creation of a tangible experience which came to life by building a teaching plan based on schools’ perspectives and experiences. In order to bring the experience back to self and make it personal the focus was directed to hands on learning and interacting with primary resources and the students being able to answer the questions: where did it come from?, how to it get here?, what is it?, and all the while being shown tips and tricks regarding what to look for when searching for the answers to these questions. Barry made a great point about how we perceive this current generation as digital natives because they are growing up linked to digital technology. However, he cautioned us to think that perhaps they are social media natives who can navigate Twitter, Instagram, Facebook and other platforms. Their use of social media platforms doesn’t necessarily make their skills transferable to the level of being a digital native. By involving the students in activities that get them interacting with primary sources the hope is to teach them invaluable skills that will lead them towards being a better-rounded researcher and digital native. Brendan Devlin from DIT provided us with an overview of L2L and where they were at. This solidified the knowledge I had gained from a previous L2L day long workshop I had attended. Hearing Niamh Hammel from Dundalk Institute of Technology share her personal work experience, being involved with L2L, and how she is looking forward to how engagement with this framework will help those of us starting out in the library field continue to further our skills, remain relevant in the ever changing library landscapes, and plan for our professional growth. This really resonated with me as I want to continue to grow and evolve as a Librarian and further my career. After lunch Dr Emma Coonan, FHEA, Academic Librarian (Information and Digital Literacies), Library, University of East Anglia presented us with a zoo full of identities as she talked about ‘New Tricks? Negotiating the librarian identity’. How we are perceived by others and how we are perceived by ourselves can be showcased by a wide variety of characteristics. She discussed multiple ‘identities’ painting elaborate pictures of different animals. Are you a labradoodle? The fetch dog who goes and gets what is asked of them? ; or the Cheshire cat, who pops up when needed and is an agent to an individual to help meet their needs whatever they may be? Or maybe you’re the platypus, the off cuts of many other animals/identities, who is flexible and able to support a large group but doesn’t have enough time to specialize because he/she covers more areas than the days of the week? Dr Coonan was very engaging and definitely got me to thinking about myself and my own perception of myself as a Librarian. I can’t say I know who my spirit animal is just yet because I feel, like the profession and the field, I am having to continuously evolve. I am so grateful for the opportunity to participate in this day. It was great to see familiar faces as well meet some new library colleagues. The day’s presenters as well as those of us that sat and absorbed reflect very much the theme of the day in as much as we are a community who have to constantly create, deliver, evaluate, restructure and deliver again. We are so lucky to be part of a library ‘family’ that is willing to share and collaborate together so not all of us have to reinvent the wheel. The Internet Librarian International Conference, took place in London 17th & 18th October 2017. Through the very good fortune of being awarded the LIR bursary for 2017 and with the support of my employing institution, UCD Library, I was privileged to attend this year’s Internet Librarian International Conference in London. This being the first international conference I’ve had the pleasure to attend, I felt very humbled by the depth of the work and research that this global range of speakers were engaged in. Kate Torney, CEO of the State Library of Victoria, opened the conference with a rousing keynote speech in which she encouraged librarians to be more assertive about the importance of their work and not to allow the public to take it for granted. This message resonated in other talks I attended that day. 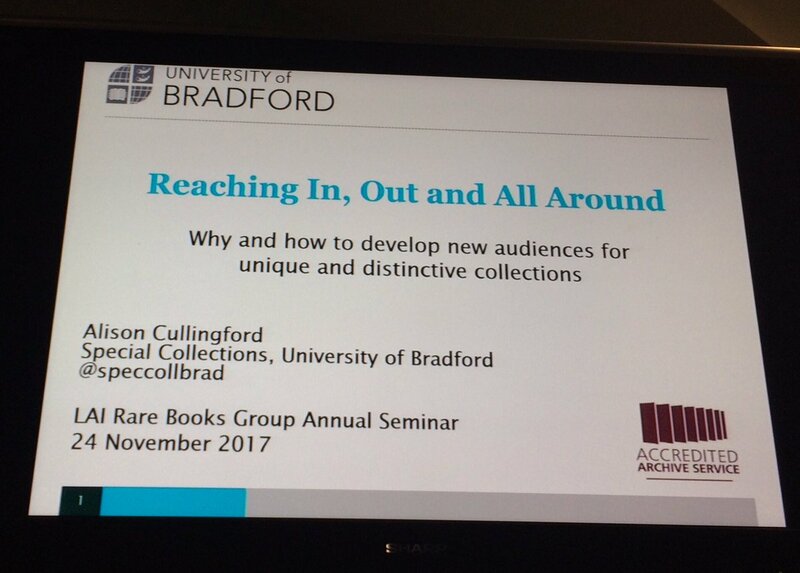 I was struck, for instance, by Marydee Ojala of ‘Online Searcher, USA’ who succinctly made the point that ‘the librarian of the future thinks in connections, not collections’. It emphasised to me that librarians are no longer the gatekeepers of information, controlling access for the few privileged enough to be allowed to interact with their resources. Rather, in a world of frenetic information exchange, it is our role to communicate the merit of our particular information resources to users effectively. Likewise, it is imperative for us to reflect on how users are actually engaging with these resources rather than how we think they should. This means listening to them as much as having them listen to us. The reality that the more open information network of today has necessitated a great deal of change to the librarian’s work practices was a strong theme of the conference. Many of the talks that took place that first day fleshed out these new practices. There were three different tracks that delegates could choose to attend: ‘The New Library, The New Librarian’, ‘Users, UX and Usage’ and ‘Content Creativity’. I spent most of my time at the UX track and picked up some invaluable insights into how information professionals are endeavouring to make their services more responsive. Carl Barrow of the University of Hull explained that his own interventions stemmed from the frustration of ‘sending out surveys knowing exactly what kind of feedback I was likely to get’. He charted his experience of employing more creative means of capturing the student’s library experience, including cognitive mapping and interview transcripts. 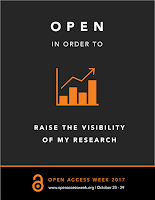 I found this approach to user engagement refreshing and daring, exactly the kind of approach needed in response to so much debate and uncertainty surrounding how to move library services forward. I was particularly taken with his idea of asking library users to submit ‘breakup letters’, detailing reasons why they would choose to end their relationship with the library. I’m sure these make for devastating reading - provoking many bitter tears from library staff - but they must surely capture a brutal honesty that a more formal survey simply can’t. Terence Huwe’s talk on the many opportunities available to librarians in the field of data analytics likewise made a strong impression on me that day. As information professionals, we get so tired of hearing what we’re not: We’re not quite academics, we’re not quite support staff, and we’re not quite administrative staff. It was heartening to listen to some concrete examples of the roles that we are well placed to occupy if we’re prepared to work hard. A keynote from David White of the University of the Arts, UK opened day two of the conference. His talk delved very deeply into what he saw as a growing chasm emerging between libraries and information professionals on the one hand and their more tech savvy user base on the other. He argued that today’s users tend to gather information in terms of networks and relevance, whereas information professionals tend to organise information in hierarchies that users have difficulty navigating, understanding or even caring about. While I’m not sure I see the gap in such adverse terms as White, I think he is attuned to a growing problem in information services. 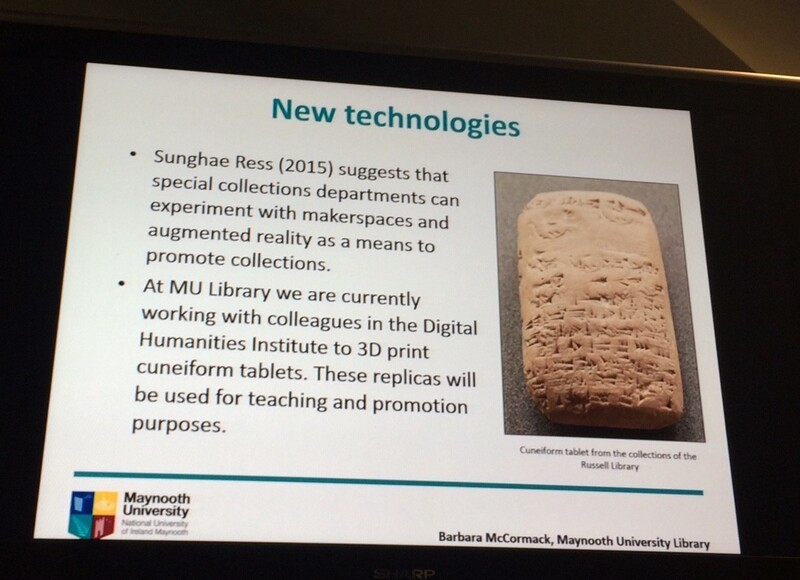 There is certainly a worrying disconnect emerging between users and librarians, and it’s one that improved interfaces and reassessment of the user experience is only going to go so far in addressing. The encouraging message that White provided at the close of his speech was that the answer (he feels) lies in information professionals taking on a greater teaching role and deepening their interaction with users; not only to offer instruction for students on how to navigate our resources, but also for us to actively keep pace with their rapidly evolving needs. Again, it all comes back to connections! This cerebral keynote set the tone quite well for what was a decidedly more tech focused second half. I was left a little in awe of the dynamism of my fellow Irish librarians in employing such enterprising means to market libraries and library services. Laura Rooney Ferris and Michael Ferris are behind the ‘Librarian’s Aloud!’ podcast which aims to communicate the work and achievements of Irish librarians to a wider audience. I was particularly interested in the mechanics of how each podcast was produced and how both Laura and Michael honed skills that they had developed outside the field of librarianship to make the podcast so cutting edge and of such high quality. Similarly, it was obvious that deeply held passions for both music and libraries drive Ronan Madden and Martin O’Connor to present their radio show ‘Shush: Sounds from UCC Library’ and to be so successful in growing and developing it. It is encouraging to see that for some innovative and dedicated librarians, the effort to market libraries can really be a labour of love rather than any kind of obligation. The final talk I attended included a very measured and insightful presentation from Ruth Graham of the University of Worcester. She has succeeded in streamlining e-resources at Worcester by minimising the number of interfaces and personalising them to give the user a more pleasant experience. Through this initiative, e-resource usage has increased by 200%. ‘It is all about building trust with your users and creating a seamless experience that they actually enjoy’, she said. The second day of this conference demonstrated to me that it is the human effort at the heart of the technology we facilitate that is crucial to its enduring success. Having listened over the course of the two full days to so many inspiring contributions from information professionals dedicated to positively developing library services and fostering deeper connections with their user base, I can only surmise that the information needs of today’s library users are in good hands. The Centre for Critical Media Literacy hosted their inaugural conference Critical Media Literacy: Who Needs It? On Friday 20th October and Saturday October 21st in DIT Aungier St., Dublin. The conference was supported by DIT School of Media and the School of Multidisciplinary Technologies as well as a dedicated team of volunteer students of journalism. I was unable to attend the opening Keynote on Friday 20th October from Richard Barbrook from the University of Westminster discussing ‘Critical Media Literacy & Digital Democracy’ with responses from Niamh Sweeney (Facebook) and Martina Chapman (Media Literacy Consultant). You can listen to a recording of the keynote and other sessions from the day on the DIT School of Media Facebook page. The majority of proceedings took place the following day and it was a jam packed schedule with a range of topics discussed from Media Literacy (ML) education to citizen journalism to surveillance and privacy. David Buckingham (London University) opened the day’s proceedings by giving an outline of the Media Literacy landscape in the UK. By not aligning Media Literacy (ML) and Media Education (ME), UK government policy has missed the mark. Essentially, ML policy was not part of ME policy and so was not reaching those who needed to be educated on ML essentials. He argued that there was a focus on ‘media use’ rather than ML and that there was a disconnect across the educational landscape. David argued that there had been a “strangulation” of Media Studies and that educators were battling against policy from the government. Curriculum in UK schools was moving towards a ‘knowledge-based’ curriculum which essentially means that media studies survives but in a reduced (and easier!) form. What do we need to tackle this? David argued that we need policy documents that align ML and ME, resources (not just textbooks), teacher training on ML, professional development networks, partnerships, research and evaluation and ME and media reform. While I would not be an expert on the ML issue in primary and secondary education in Ireland I could recognise the issues that David raised. Next up was Sheena Horgan talking about her involvement with MediaWise. MediaWise is a new education resource to help teach primary school children about media, advertising and fake news. The resource was developed to help media literacy education move away from only focusing on media skills development to empowerment. Sheena argued that we all have a collective responsibility when it comes to educating children -parents, the media industry, the government and educators. Librarians were not mentioned however. Why? The next talk came from Kate Shanahan (Head of Journalism, DIT) and Róisín Boyd (School of Media, DIT) and they showcased the excellent work being carried out by DIT journalism students in delivering CLiC News. CLiC News is a free student produced rolling news service set up through collaboration between the DIT School of Journalism, Access & Civic Engagement Office (ACE) and Students Learning with Communities (SLWC). It is essentially media literacy in practice. Clare Scully (School of Media, DIT) presented on the idea of ML usually being taught within the context of a ‘one-size fits all’ module. She argued that this is not effective when it comes to teaching students studying a range of media subjects. A module needed to be developed for media students that uses the language of the discipline and is based on pedagogical aspiration and approach. Clare argued that there was a conflation between general literacy and ML literacy problems and that the one-size fits all model goes against the aspiration of an ML module. Her research shows that students rank soft skills of academic writing etc. over critical thinking and evaluation which is opposite to how academics rank them. Ongoing development is needed and one module for all box ticking does not work. The first break out session I attended looked at Social Science Experts and the Media. Barry Finnegan was first up to discuss Critical Media Literacy (CML) and trade agreements. He focused on TTIP and CETA and showed that despite CETA being the trade agreement that Ireland operates under there was more news coverage for TTIP. News coverage was primarily in the finance section of newspapers and the balance was pro-TTIP. Barry questioned why was it presented primarily as a finance story despite being a public interest story? Next up were DIT researchers Joseph K. Fitzgerald and Brendan O’Rourke who are looking at the prominence of economists in Irish public discourse. They outlined how, since 1910, economists have slowly been granted authority by the media. Their research shows that economists have moved away from only governments granting authority to the media now granting that authority. Essentially moving from an academic order to a political order and now on to a media order. Leena Ripatti-Torniainen (University of Helsinki) presented her research on public pedagogy. Leena’s research looks at public pedagogy as an approach to teaching experts to act in the political public sphere. She argues that we need to support student autonomy and judgement and that we can promote the teaching and learning of ML through acting in the public sphere. Following Leena we had Henry Silke (UL), Maria Rieder (UL) and Hernik Theine (WU Vienna) presenting on the representation of ‘celebrity economists’ in the media, focusing on Thomas Piketty. They showcased the alarming trend of economists going unquestioned with their opinions being presented as fact. Their study looks at news coverage in four countries and how there is little disagreement with Piketty. The study uses a Corpus Linguistics methodology and alarmingly, when economists are discussed in the media words like ‘star’, ‘celebrity’ and even ‘messiah’ appear quite frequently. Looking closer to home, there is generally large agreement with Piketty across the Irish press showcasing a lack of protest and theory presented as reality. The next break out session I attended looked at Truth or Data -Accuracy, Privacy and Surveillance at which myself and my colleague Róisín Guilfoyle also presented. Sarah Kearney (BL) opened the session looking at recent data protection cases in Ireland such as Schrems v Data Protection Commissioner which looks at the transfer of data from the EU to the US. and Digital Rights Ireland v Minister for Communication & Ors which looks at data retention and IP tracking. Sarah also spoke about the Fennelly report (March 2017) and the new General Data Protection Regulation which will come into force 25th May 2018. Next up was Dr. Eileen Culloty (DCU) who presented on why fake news succeeds and how to oppose it. Her research looks at the online reasoning abilities of 2nd year undergraduate journalism students. Eileen used two control groups in her study, secondary school students and also secondary school students from the Centre for Talented Youth (CTYI). Eileen’s findings show that the journalism students in her study are over-reliant on heuristic principles/thinking and therefore fail to identify fake or biased websites. Myself and my colleague, Róisín Guilfoyle (DIT) were up next and we presented on the similarities between ML and IL and that our experience matches the findings of a lot of literature and also Dr. Culloty’s (DCU), in that the majority of students lack critical thinking and evaluation skills. We also presented on the premise that our academic peers do not know that Librarians teach IL, and in particular, we teach critical thinking and evaluation. 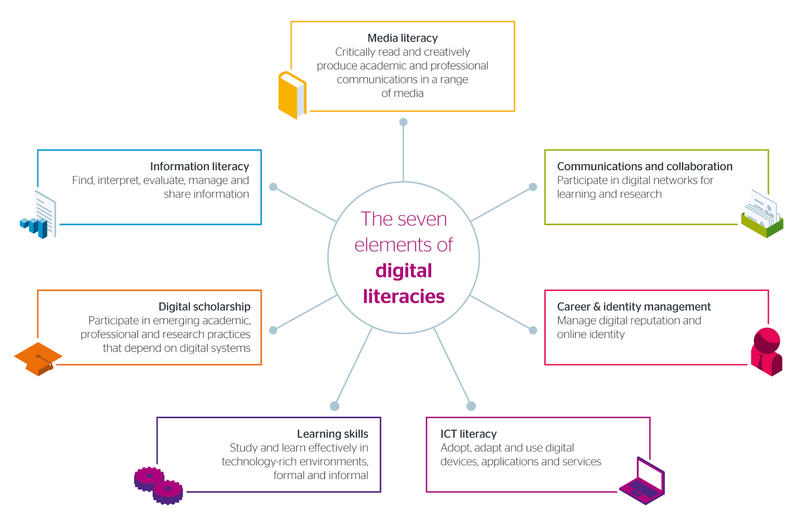 We argued that librarians and academics need to collaborate in teaching Digital Literacy based on the JISC Seven Elements model (see image). 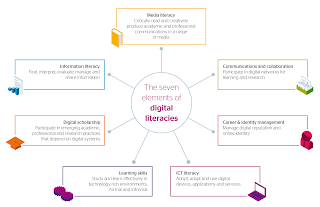 This is a term that will resonate with future students as Digital Media Literacy is now a subject on the Junior Cycle at second level and is also a DIT graduate attribute. Our suggestions were strengthened by the next presenter, Isabelle Courtney. Isabelle has just recently finished the MLIS in DBS. Her dissertation looked at the role of information literacy in journalism education in Ireland. Her findings suggested that again there are similarities between the literacies and that collaboration is required between academics and librarians. She argued that there is a lack of awareness among media academics of the ‘teaching librarian’. The last to present in this session was Cliodhna Pierce (DIT) whose research looks at the comparison between models of surveillance in East Germany and Northern Ireland and examining their relevance to the securitisation of today’s society. It was fascinating to see the similarities between data collection and surveillance during the past and present. Cliodhna argued that the public seem to be more concerned with surveillance over personal privacy. The closing session focused on Journalism, Technology and the Public Sphere. Jen Hauser (DIT) presented on her research looking at amateur journalism with a focus on the coverage of the Aleppo offensive. Jen showcased how collaboration between professional journalists and amateur news coverage or footage is now commonplace. There is a new role for professionals in managing this collaboration and managing impartiality and bias that may exist in citizen journalism. Next up was Kathryn Hayes (UL) who presented on freelance journalism in the age of social media. Kathryn argued that freelance journalism is the largest growth area in journalism. The precarious nature of the role of freelance journalists was outlined. Her findings show that younger journalists are more engaged with social media and technology to source information. They show less distrust of the medium. Older journalists rely on the older methods of interviewing people face to face. Kathryn questioned whether reliance on freelance journalists was sustainable and what are the implications for journalism? My overall take away from this conference was the need for partnership and collaboration between librarians and academics. We all have a collective responsibility to enable students with the relevant skills to be media literate in an ever-confusing and complicated media landscape. The majority of presenters throughout the day mentioned the need for critical thinking and evaluation skills to be taught to students. There seems however, to be a complete lack of awareness among our academic peers and others that Librarians teach just that. As a profession we need to take control of how we are perceived and communicate our skills and expertise to those with which we can collaborate. Rather than waiting to be invited we can invite ourselves and ask to be involved in developing modules, programmes and curricula that supports media literacy and information literacy. We need to promote ourselves as stakeholders in this area on a national level. I have published this post to let you know SEDIC, the Spanish association of information management professionals, and the activities it organizes. In Spain there are also other regional associations, which are accessible by the website of their federation. SEDIC was founded in 1975 and is devoted to sharing experiences and training librarians, documentalists and archivists. It also assumes an active role in representing the interests of our professional community to Spanish government administration, European Union and various international organizations. Disseminate the importance of information management for economic and scientific development, by stimulating the use of technologies and sources of information. Facilitate access and contact with the job market, by building bridges between offers and demands. Indeed, SEDIC manages a job bank. Encourage professional associations and stimulate the international relationships with colleagues from other countries, especially the European Union. Coordinate the activities of its members with those of other associations grouped in FESABID (Spanish Federation of Archival, Library and Information Society Associations). To train specialists in Information and Documentation, by collaborating in the design of universities' curricula regarding Librarianship and and providing professional courses. Represent the Documentalists and Librarians to government administration and organizations related to their area of ​​activity, as well as in associations, conferences and international meetings. SEDIC organizes throughout the year many courses aimed at information management professionals. Passing the courses results in a certification that will vary according to the interest shown by the students and the tasks that they have successfully completed. There are some training itineraries in which courses have been grouped by areas of specialization essential in our professional field. 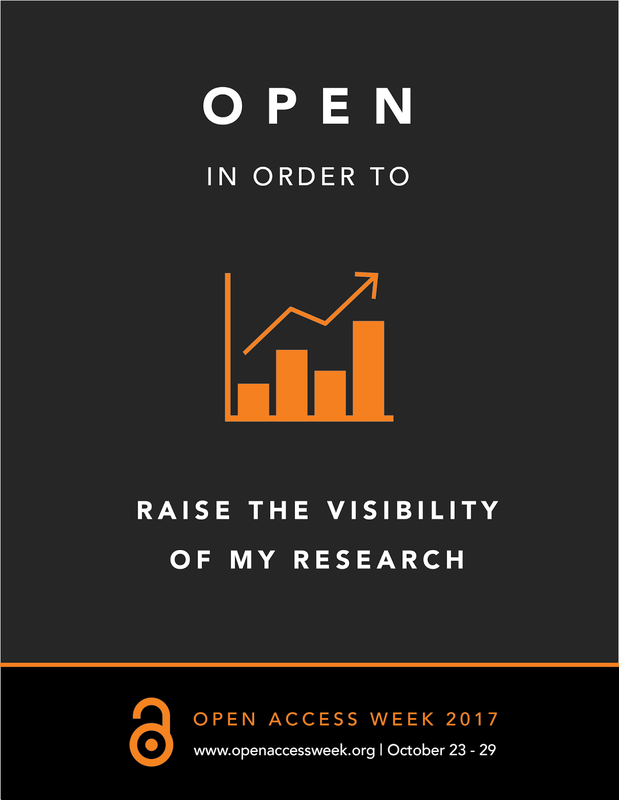 Scientific Publication and Production: citations, bibliographic managers, altmetrics, etc. Archives: government's archives, cloud technology for small companies, International Standard Archival Description, etc. Web Technologies: resposive web design, management of digital repositories, semantic web, etc. Documental processes: cataloging, MARC, RDA, etc. Legislation: intellectual property in the digital age, e-goverment, etc. 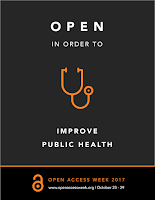 Specialized Information Resources: health, economic and financial information, European Union resources, etc. Communication and marketing: content marketing, creation and edition of video content for social networks, social media plans, etc. Technology for Documentalists: digital preservation, content management systems, etc. Management and Planning: teamwork strategies and tools in virtual environments, geographic information on libraries, gamification and meaningful engagement, etc. In addition, SEDIC organizes no-cost seminars and workshops in which specific technology, techniques or tools are taught. Expert search strategies on Google. Preservation and sustainable conservation in archives and libraries. SEDIC organizes a conference every year called Information Management to communicate what challenges information management professionals must overcome. Likewise, the most innovative aspects are exposed in the different specialties: librarianship, archives, etc. Our profession has changed a lot in the last decades. Apparently, the roles, processes and challenges of information management institutions have little to do with yesterday's. How has the work of the information management professional changed in the last thirty-forty years? How did you imagine the future of the profession then, and to what extent have the steps taken built what we are today? What great innovations did the preceding generations (and not necessarily technological ones) deal with? In what ways have the concepts of user, utility and social relevance, collection management, user satisfaction and evaluation, access, citizen participation, services, etc. evolved, and to what extent has it impacted our roles, training, professional objectives? How do we imagine today that these concepts will evolve, and where do we understand that the steps we are taking on this path will take us? It is an innovative idea born in 2014 that is driven by SEDIC and Universidad Complutense de Madrid's Department of Library Science. In this conference many companies related to information management show their most innovative products and services. The main purpose is to seek synergies between professionals, researcher and professors by creating a discussion forum around technological tendencies. Furthermore, in order to promote innovation and its application, awards for the most innovative bachelor and master thesis in the field of Librarianship and Information Science take placed during the conference. SEDIC organizes guided tours and outings to institutions such as libraries and archives. Library and Museum of the National Astronomical Observatory. Archive of the Spain's Bank. Library of a high school. Spanish National Library's Department of Fine Arts. Library of the Constitutional Court. SEDIC organizes meetings between professionals in which there is no lack of refreshments, agape and music. The objective is to design an informal experience for sharing professional knowledge and getting to know other people that have librarianship in common. Likewise, the members have an employment portal in which job vacancies are published and filtered by SEDIC, as well as a discussion forum. Revista Española de Documentación Científica, which is a scientific journal. Moreover, SEDIC publishes various publishing novelties in all types of genres (narrative, essay, specialized monographs, poetry, etc.) and allows its members to get free copies that are given away by the publishers. The members can even participate by making their own reviews and publishing them on SEDIC's Blog. In June of 2017 a number of CONUL Dublin Libraries got together to organise an exchange week for a group of visiting European Librarians. We recently posted a post on the exchange from the perspective of one of the organisers Allison Kavanagh. This post tells us the story from the perspective of one of the participants. We were 17 library staff from 10 different European countries, only me from Sweden, Lithuania, Finland, Spain, Italy, United Kingdom, Poland, Czech Republic, Austria and Germany. Many of us had different expertise and background. Working places were academic libraries in subjects such as technical, health sciences and law. The size of libraries varied from one to a hundred of employees. We also got to see the libraries (guided tours), working places and talk to many of the employees. The organizing team did a very good job helping us to find our way everywhere! This exclusive program was organized for the first time in Ireland, by libraries in cooperation with CONUL (Consortium of National & University Libraries) and ANLTC (Academic and National Library Training Co-operative). At libraries in Ireland and United Kingdom it is common to offer special rooms for post graduate students. Next stop was the beautiful National Library of Ireland (NLI). We got a presentation from Sandra Collins, the Director of the National Library of Ireland. She presented the strategy 2016-2021 which include: COLLECT; PROTECT; CONNECT; INNOVATE; COLLABORATE. For the moment, they offered an exhibition about William Butler Yeats: The Life & Works of William Yeats which we got to see with a very professional guide. The second last stop for the day was Royal College of Surgeons in Ireland (RCSI), which has a totally new library, not open to the students until July 3. The guided tour in the new library spaces was interesting. They had been inspired by Karolinska University Library and had a lot of opportunities for students to find a peaceful place to study. I loved the light and spacious building. They did some mistakes; bought some furniture they had to return after they tried them out. That was some kind of FatBoy (beanbag) but when trying to sit down it was like a slide instead of a seat. By all the computers there were signs with the phone number to the IT Helpdesk and the AV Helpdesk which I found very nice. The new library has many group study rooms where presentations can be held, for real or for practice. They had whiteboards in the study rooms. The Royal College of Surgeons in Ireland has their own fitness area with place for playing tennis, a gym and a separate Female Gym & Fitness Studio. We were finishing the day with snacks and drinks at the National Library of Ireland. On Tuesday morning, we were invited to University College Dublin and James Joyce Library. UCD is the largest university in Dublin and it´s 160 years old. James Joyce was one of the graduates. This day we listened to “Library change experience – Challenges and Success” by the Head of Client Services Peter Hickey, “E-learning and Supporting the globalized University” by James Molloy and “The impact of Information Literary, how to demonstrate evidence” by Marta Bustillo (Erasmus delegate). In the afternoon, we listened to Ursula Byrne; “The Past, the Present, the Plans” which was really interesting. Ursula is Head of Development and Strategic Initiatives at James Joyce Library. Ursula showed how developments have been done over time, step by step and little by little. We also started with Theme 1; Information & Digital Literacies and in the afternoon Theme 2; Space and Storage. Eight participants lectured this day. University College Dublin has worked a lot with eLearning. They´ve made 16 instructional videos, 15 interactive tutorials, 79 LibGuides and 27 guides/presentations. These guides are not only for the students, but also for people outside the community. UCD has a campus in Beijing where the online support helps. In February 2017 people from UCD Library went to Beijing to meet students and find out how the resources were working overseas. Marta Bustillo continued talking about The Impact of Information Literacy - How to Demonstrate Evidence. At UCD they are using three main tools for measuring impact. They had a Feedback tool, Information Skills Training Record (in Google Form) and UniShare. Every action was written down in the system, queries received by the Library on various topics. Marta talked about the Butterfly Effect and they just started to join a new course with 150 students. The information skills were embedded in the module syllabus in the VLE (Virtual Learning Environment) which was used. We visited the Old Library with wonderful Long Room and The Book of Kells which has 900 000 visitors every year. The theme this Wednesday was Culture Heritage and Unique & Distinct Collections and Enabling Research. Regina W. Richardson, new at TCD, formerly Maynooth University, presented “Orcids and Orangeries: Gaspar Fagel and the new exotics from the Dutch colonies in 17th century Europe”. Arlene Healy gave us a presentation about the IReL, a national consortium with databases, e-book collections, single titles etc. which has been in work since 2000s. Value for money is important in Ireland as it is elsewhere. In the evening, we went to a social event organized by the committee. Dinner at the 1592 Restaurant at Trinity College Dublin. That was an excellent evening! The John Paul II library at Maynooth University, which was built 2012 was both green, light and had a lot of different study places. MU Library arranges many LIST lectures (Library & Information Skills Tutorials). It is 30 minutes lectures often led by the library. When showing us the working places they told us about the changes the library has gone through. They organized an art workshop with the staff where they could paint their feeling on a wall. In Maynooth, we visited the old Russell Library, with collections from St Patrick´s College and the College Chapel. I also met Helen Fallon in Maynooth. Helen is the editor of the journal where me and my former colleague Sassa Person published an article 2016. Helen Fallon did Erasmus in Sweden in June 2017 where she visited Linköping University. Finally, before going back to Dublin, Helen organized a special tour of the castle in Maynooth which everybody appreciated. Ellen Breen from the Research & Teaching Team described the focus on building and managing relationships/partnerships and the need of strategic, focused and proactive engagement, both formal and informal. We must promote the work we do, increase our visibility and work as efficiently and effectively as possible. In January 2017, they did a faculty survey with the goal to identify priorities for faculties. There was a three part online questionnaire with 7 questions. They had 182 respondents. The outcomes were that they are starting with LibGuides, having online support for graduate students and researchers, creating more sessions, working with flipped classroom…. Just before lunch we got our diplomas and people said goodbye and some were heading to the airport and some went back to town. It was a wonderful experience and it will enrich my work at Linköping University Library. Meeting so many European library staff and talking about similarities and differences in libraries was a fantastic opportunity. We talked a lot about changes in libraries and how we conduct our daily work. We met directors, librarians, library assistants and different kind of employees. I really enjoyed the great schedule. We got time for a lot of discussions but the time went too fast. It was very easy to get to know each other. We are still in touch by What´s App, e-mail and we´re talking about a potential cooperation project. I have got insights in my new friends working places in their countries. Special thanks to the organizing committee (ANLTC, CONUL and all the libraries with staff) which helped us a lot and gave us a fantastic week! Everything was well-organized and the participating people and staff were so nice and helpful. Also thanks to International Office and Lotta Kåvemark at Linköping University. University College Cork as part of its Sustainability Strategy is committed to monitoring the impact of the University on the environment. The Office of Building and Estates plays a key role and responsibility in managing the University’s environmental impact. In September 2016 the library was approached by UCC Building & Estates Energy & Utilities manager Pat Mehigan. Pat put forward a case with regard to the energy consumption in the Library and asked if we would be willing to join with him and his colleagues to reduce the energy bill for the Boole Library. Colette McKenna, Director of Library Services was very supportive of the idea and asked that I liaise with Pat to see how we could achieve this. It was a bit of a leap in the dark for me (forgive the pun) as I had no previous experience in this area but always have had an awareness of environmental issues so was very willing to give it a go. Pat was very enthusiastic and easy to work with and we started out on a journey to save the planet!!! The first step the library took was to sign up to accepting an annual budget for electricity, which if exceeded would incur a charge for us and if under spent would mean money back to use on energy saving projects. The Boole Library spend on electricity for 2015/16 was €263,000 which accounted for 10% of the University budget on electricity - definitely worth taking a look at from both an environmental and a cost issue. We were allocated this sum for 2016/17 and we then set out to see how we could make reductions. Air conditioning and heating was improved to office areas which resulted in the turning off of individual heaters at staff desks and a happy staff!! Changes were made to the lighting in the old part of the building in the summer of 2016. Light bulbs were changed to energy saving LED ones. Throughout this summer lights were turned off in the main reading rooms and students used overhead desk bulbs and daylight to study. This along with changes to timing of lighting saved a whopping €15,000. A major problem with cold air on the ground floor has been resolved by the removing the old air curtain and putting in its place an air barrier. The air barrier prevents cold air coming in to the library and keeps in the heated air. A by-product of this is that it also keeps out the leaves!! The air barrier cost €25,000 to install. A grant of 30% was received from SEAI and savings made on the lighting went towards the cost. The air barrier will save €8,000 a year in running costs. New projects to do with expensive air cooling systems in Special Collections and Archives are being investigated. This is an area of the library where there are requirements for very specific temperatures for the handling and storing of manuscripts, fragile material and archival collections. The new system being investigated will be more energy efficient and cheaper to run. We will be looking out for more ways to conserve energy into the future and will be engaging with staff to keep the momentum going. While all of this time was being spent on looking at how environmentally friendly our library was, we became acutely aware of the amount of waste which the library was generating. There were 167 bins spread across the Library using up to 10,000 plastic bags a year. These bags were heavily contaminated and there was virtually no recycling during semesters. We looked at lots of options and decided that we would have to do something dramatic to make a difference. So from the 4th September 2017 we are introducing the Love Our Library campaign. The scope of the campaign is to improve energy consumption, waste consumption and water consumption. Binless library – students will be required to bring all their waste and recycling to the ground floor. Proper recycling stations on the ground floor of the library will make it easier to do the right thing. These stations will have 4 bins – waste, plastic, paper and batteries. All drinks to be in reusable cups and bottles. Paper cups for tea & coffee will no longer be allowed in the library. Staff and students will be expected to use re-usable containers.
. The Library is now a key partner and driver of sustainable change and activity within the UCC campus. This is my first post on Libfocus as a member and I am showing you on which librarianship learning at Spanish universities focus. The points I am explaining are a brief history of the field; the official bachelor's degree of librarianship, its competences and where is possible to study it; and some examples of further learning that consist of some masters regarding information and knowledge management, digital libraries, preservation, archives, etc. In Spain, the first schools of Librarianship and Documentation emerged in the nineteenth century to train the archivists and librarians in charge of either governmental archives and public libraries. Later, in 1978, the field was officially established at universities as what we, the Spanish, call Diplomatura and Licenciatura in Biblioteconomía. The former's curricula lasted three years. The latter's curricula lasted two years more (so five in all) and it was required for students to have achieved the Diplomatura previously. With it, the Bologna reforms established in spanish universities, Diplomatura and Licenciatura have been turning into bachelor's degrees and masters. As for Librarianship, the official bachelor's degree was called Grado en Información y Documentación in 2004. If you are curious and you would like to know more, you should look over this post: Mapa de los estudios de Información y Documentación en España (Carmen Morales, 2016). Despite the fact that each university have designed their own curricula, they must get learners skilled in a series of competences. These competences are pointed out in Libro Blanco del Título de Grado en Información y Documentación (ANECA, 2004). Two types of competences are taken into account: specialised and generic ones. Interaction with producers, users and clients of information. Knowledge of professional documentation environment. Knowledge of both national and international legal framework regarding information management. Identification, authentication and evaluation of sources of information. Management of collections and funds. Preservation, conservation, and physical use of records. Analysis and representation of information. Organization and storage of information. Search and retrieval of information. Creation and dissemination of information. Techniques of installation, conditioning and equipment. Planning techniques and project management. Techniques of diagnosing and evaluation. Techniques of human resources management. Instrumental abilities: to analyze and synthesize, to organize and plan, oral and written communication in the native language, knowledge of a foreign language, computer skills related to the field of study, information management, problem solving, and decision-making. Personal skills: teamwork on interdisciplinary teams, working on international contexts, interpersonal skills, awareness of diversity and multiculturalism, critical reasoning, and ethical commitment. Systemic competencies: autonomous learning, adaptation, creativity, leadership, knowledge of different cultures and their customs, entrepreneurship, quality-oriented motivation, and environmental awareness. Where is it possible to study it? Some universities have begun to redesign this degree. Indeed, Universidad Carlos III de Madrid has changed it recently. Its new name is Management of Information and Digital Contents and is going to be inaugurated next course. To my mind, it is worth taking a look. The newly compulsory subjects that have been included are: information architecture, multimedia content, statistical data analysis, digital marketing, social networks and virtual communities, transparency and electronic government, advanced professional skills, metric studies of information, electronic records management, digital preservation, analitics and web positioning, data visualization, and competitive intelligence. As for elective subjects, they are: digital publishing (seminar), digital paleography, digital information literacy, semantic web, data science, creativity and design, brand and online reputation management, digital entrepreneurship, advanced metadata, open science (seminar), open data, big data, and industry 4.0: direction and management. Once students and professionals have obtained the bachelor's degree in information and documentation, there are several masters related with the librarianship universe. Thanks to this search engine, we can find the masters I have referred to. You had better search by using some of the following words: información, archivos, archivística, documentos, bibliotecas, or museos.